After a hugely successful run at the Chichester Festival Theatre, Half A Sixpence has hit the West End with a flash, a bang and a wallop. Actress Devon-Elise Johnson, who also starred in the show in Chichester, is currently appearing as Ann Pornick, the adorable and down to earth love interest of protagonist Arthur Kipps. Devon was kind enough to chat to us about her role in the show, the incredible audience reaction, and why Half A Sixpence is still such a popular story today. Flash Bang Wallop is SUCH an iconic musical theatre song that everyone seems to know somehow. How familiar were you with Half A Sixpence before you auditioned for it? I didn't have a clue quite frankly! I'd heard Flash Bang Wallop before because when I was about 13 I did a charity event and one of our numbers was Flash Bang Wallop! We wore sequined coats and it was all very classy, as you can imagine, but I didn't really think anything of it. I knew I enjoyed the song, but I had no idea where it came from. Especially at 13 years old. My agent phoned at half past ten on a Saturday night and said "Devon, stop what you're doing. You have an audition on Tuesday morning for Half A Sixpence!" I said "what's that?" and she said "for goodness sake, research it, girl!". I had 9 pieces of material to learn for the audition- 5 songs and 4 pieces of script. I had no way of playing the songs because I don't play piano, but I was attending a singing lesson on Monday night and so I managed to learn 5 songs and 4 pieces of script for Tuesday morning. And I watched the film and absolutely loved it! It's just good old fashioned musical fun.That's the thing about older musicals... you don't need swearing and you don't need a harsh subject matter to get the musical across. It's just a good old fashioned love story. Innovative, isn't it? Andrew Wright's choreography is incredible. I couldn't wait to get my hands on. Especially when he told me that I was allowed to dance in Flash Bang Wallop. I couldn't contain my excitement! Of course, when he showed me the things I'd be doing I stood there open mouthed, asking "are you sure you want to put me at the front?" But he's incredible. His choreography is absolutely seamless, and it compliments the show so well because it's so quirky and innovative. You mentioned that Half A Sixpence is a good old fashioned British musical. Why do you think that now is such a great time to bring it to the West End? Because there's nothing else like it in the West End right now. If you look at all the older musicals that are on at the moment, most of them are American. They may very well be old fashioned but Half A Sixpence has got something special. I know that Cameron [Macintosh] had been hoping to bring Half A Sixpence to the West End for approximately 10 years, if not more, but he had to try and get the rights, he had to go through the Henekers, and Julian Fellowes adapted the book. It's classic British musical theatre and I think the West End has needed something like that for a long time. We've got a lot of modern musical theatre, which I adore, but I think for our culture and history it needed to come it. It will show tourists a little insight into what it was like in England way back in the 1800s. It's good old fashioned family fun and I think it's lovely! Yes! There's no sadness in it really! And everyone at the stage door is really positive and some people have been saying that they're going to come back, which is incredible! We must be doing something right! Have you noticed much of a difference between the Chichester run and the West End run, in terms of the audience or general atmosphere? Absolutely! Chichester was beautiful and I adored it down there. The audiences were much older there actually, but even so, every single day at every single performance we had a standing ovation, which is incredible! It was magical to see them leap to their feet after a few hours of Half A Sixpence. The magic of musical theatre is just insane! But I think it is quite different here in London. We're in a much smaller venue, which is much more intimate. Although it's got 4 tiers it is a smaller audience, but I think it works because you get drawn into the story, and even from the balcony you can still see every single facial expression, move, breath even, which is incredible! London audiences are different too because they're much more diverse. We've got people coming over from different countries, visiting the West End. We've got a lot of children also coming to see the show. But in terms of the reaction we're getting, it's pretty similar. Everyone seems to be really, really enjoying it! What's your favourite thing about playing Ann? Ooh good question... what I love about Ann is that she's so feisty! And she's so normal. I don't know if you know this, but the whole show is seen through the eyes of Arthur Kipps, so that's why in Pick Out A Simple Tune the characters are all in a bright green colour because it churns his stomach to be there, and he doesn't know how to react. But when you see Ann she's so normal and so grounded. And I can relate to her even in the 21st century, she's so relatable and normal. She's like an old fashioned Essex girl! If you could play any other role in Half A Sixpence, who would you want to play? I'd love to be Flo. 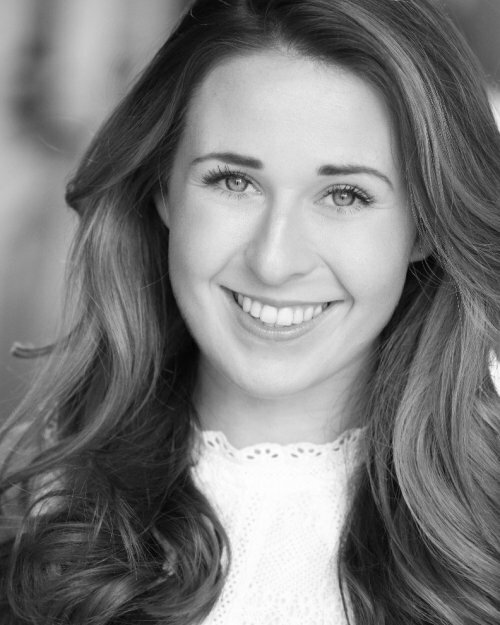 I think she's such an adorable character and Beth [Bethany Huckle] plays her so well. She's so sweet! My favourite number in the show is Touch Of Happiness with her, and we have such a giggle on that stage and get on so well together, so I'd definitely like to be Flo... because she's cute! And finally... in keeping with the name of this blog, what is the stagiest thing about you? Oh...I have posters all over my walls, of shows that I like and shows that I've been in. That's quite stagey! And I've got a couple of spotify playlists that are pretty stagey too, but they only come out on special occasions of course. I've literally got stage stuff all around my room... I've got Phantom of the Opera, Mamma Mia, Taboo and Half A Sixpence on the wall now too! I'm not overly stagey, but I do like a poster! Thanks so much to Devon-Elise for taking part in this interview! You can read my review of Half A Sixpence here, and visit www.halfasixpence.co.uk for more information and to book tickets.